Was the oldest passenger ship in service ! - Built in 1914 ! The american 1914 built ship ' mv Doulos ' which having been built as a cargo ship and then converted in Italy in 1949 to the emigrant ship ' ss Roma ' is now land locked ! After about five years of service as an emigrant ship she was bought by Costa Lines and having been re-engined and upgraded operated cruises for them as the ' ms Franca C ' from about 1953 until 1977 ! She was then aquired by a german charity and having been re-named ' Doulos ' was converted into the worlds largest travelling book shop and visited many countries around the world with her crew carrying out work to assist the local people and also helping to maintain the ship. 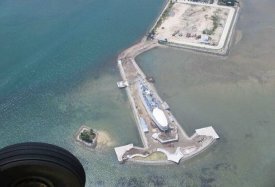 In 2010 she was withdrawn from service and having been aquired by a business man in Singapore plans were made to turn her into a tourist attraction and hotel. She was re-named ' Doulos Phos ' by her new owner and as no berth could be found for her in Singapore she has now been taken to the Indonesian holiday island of Bintan, which is connected to Singapore by regular ferry services. 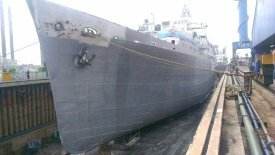 Work carried out at the ASL Shipyard at Batam included the scraping and preservement treatment of her hull along with work inside her. With that work completed she has now been towed and beached at what is to be her new home where work will now continue to open her to the public.